A Rancho Bernardo family was displaced after flames destroyed their three bedroom home. 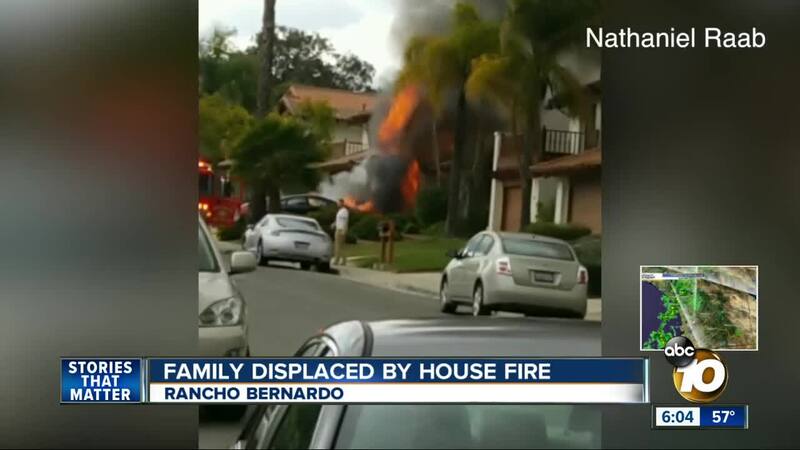 SAN DIEGO (KGTV)— A Rancho Bernardo family was displaced after flames destroyed their three bedroom home. Crackles and explosions rang through the neighborhood Sunday. San Diego Fire-Rescue crews arrived at the house on Avenida Nobleza just after 11 am. Ken Kaghazchi said he was taking a shower when his wife suddenly screamed. She heard, then saw, the garage on fire. His wife immediately grabbed their dog, called 911, then ran outside. All they could do was watch their home and 24 years' worth of memories burn to the ground. “Right now, the house is gone. The cars are gone, it looks like,” Kaghazchi said. While they may have lost a lot, they said they were counting their blessings. They still had each other. And for that, they had the brave firefighters to thank. “I definitely want to say ‘thank you.’ I have always been appreciative of them. And I am now, that it happened to myself,” Kaghazchi said. Firefighters were able to contain the fire just to the one home. Investigators have not yet determined the cause.